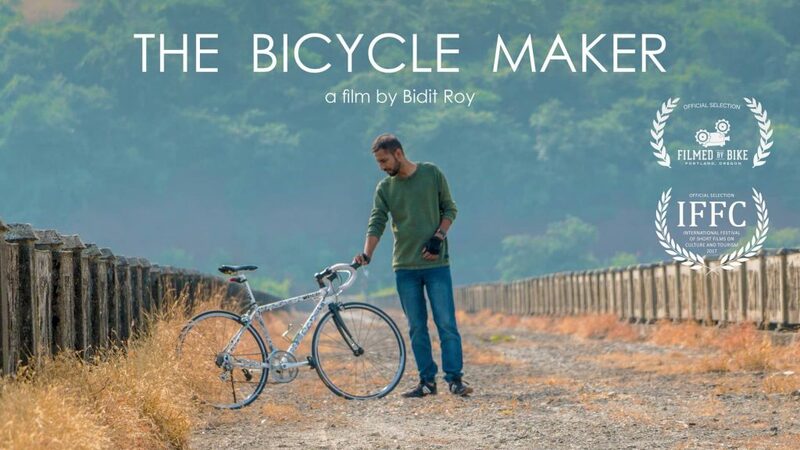 Bidit Roy is no stranger to community activism and social change efforts, but he had never thought of the bicycle as a tool for bringing together people from different backgrounds, until he met bicycle filmmaker Shailesh Krishna. Bidit says Shailesh also had a child-like tinkering inquisitiveness that charmed him. Bidit, who is from Pune in western India, says he loves the entire process of filmmaking “I enjoy the whole process of hunting stories, getting to know the subjects, the shoot and – most important of all – crafting it all together in the editing stage. Bidit works alone, which he says has its challenges as well as rewards. He did, however, employ some assistance in filming “The Bicycle Maker”. Bidit says in order to achieve fluid shots when filming his subject in motion on a bike, he hopped on a bike with a friend, and strapped himself to the rider so he could easily film without fear of falling off. Considering the breadth of complex topics Bidit covers in his films, it is impressive that he works solo. Many of his pieces profile working on positive change – they are uplifting stories of hope for a better world. We asked Bidit to describe a few of them. “Bamboo Lawada” is the story of Sunil and Nirupama Deshpande, a couple living in a remote village who have spent the past 20 years empowering and uplifting the tribal community with upskilled traditional bamboo craftsmanship. Using technological know-how they produce an array of articles ranging in size from as small as a paperweight to as big as a full fledged house. “On the Church Trail” is an hour long documentary which explores the lesser known heritage stories of the Churches of Pune. These churches have played a pivotal role in influencing the course of history as they provided spiritual nourishment to the Christian soldiers who had come to the region. “Madhur Bhav” profiles Anjali Deshpande, Founder, AJ Foundation, who has embarked on a life-long journey to give love and care to the elderly people looking for community living facilities. Expect more bike movies from Bidit. His next piece, due out this year, is a profile of a vintage bike collector with historically significant pieces that date back to the Second Wold War. “The Bicycle Maker” plays Sunday, May 7, in the 5:30pm show.